You’ve set the date and sent the most adorable first birthday party invitations. The decorations match your theme perfectly and the specialty cake has been ordered. Everything is set for that moment when guests arrive, but how will you entertain them once they get there? 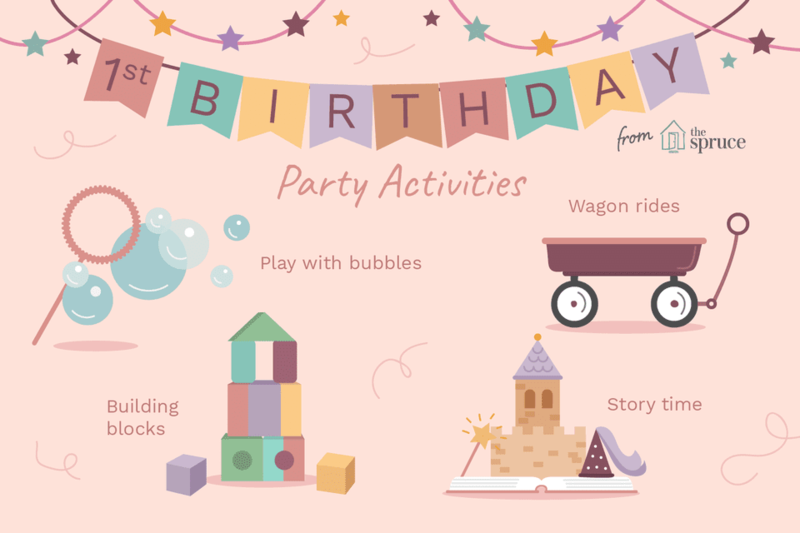 Since most first birthday celebrations include relatives and friends whose ages range from young to old, you may wish to plan a variety of activities so that everyone from the birthday girl to grandpa can join in the fun. A sectioned off area for soft play is a safe and fun place for babies and toddlers to gather while bigger kids are busy with games like musical chairs. Place a soft mat in a corner of the room, or use click-together style baby gates to create a baby zone in the center of the room. Fill the space with foam balls and soft blocks that babies can enjoy whenever they need a little time away from the bustle of the party. Does anyone really ever outgrow the fun of bubbles? Hand out plastic cups to kids, turn on a bubble-pumping machine and challenge them to catch as many bubbles as they can. The birthday girl may need some help, but even if she doesn’t completely grasp the concept, she’ll be just as happy to simply play with the bubbles. Don't have a bubble machine? Just have some of the older kids blow bubbles for the younger kids to catch! Decorate a wagon with streamers, stickers, and balloons. Hang a sign on the wagon that reads “Just Turned One!” Place the birthday boy in the wagon and pull him around the room as guests cheer and wave. After the first ride, have the other children line up for their turn at a wagon ride, or bring in a few wagons and ask other parents to help give rides to the kids. If your baby is walking, she can join a parade. If she isn’t, mom or dad can surely carry her! Give out play instruments and ​musical toys, and lead guests around the room in marching band style. If your party has a theme, so can your parade. A zoo-themed party, for instance, can include a parade of children carrying plush animals. If you have the space, you can even incorporate a pull wagon and ride on toys. It’s a joke many parents make: It doesn’t matter what toy you pack inside, chances are the kids are going to play with the box instead. Set out a few cardboard boxes and let kids have their own fun crawling in and out or turning them into imaginary rocket ships. Little ones may also enjoy some wrapping paper to crumple into balls. If you like, you can even supply some stickers and crayons that kids can use to decorate the boxes. Many babies enjoy playing with building blocks, and while not all one-year-olds can build a large tower, they certainly all love to knock them down. Have bigger kids help the birthday boy construct a building and then let him knock it down. Build several towers at once and watch him squeal with delight as he paves his path of destruction. Fill a box or cookie tin with mementos from the first year, such as pictures, footprints and a lock of baby’s hair. Place them in a box that will become your child’s first birthday time capsule. Ask guests to write notes for the baby to place inside the capsule. Some ideas for notes may be a memory of the first time guests met your baby girl or their hopes for her future. Set a date for the opening of the time capsule, such as on her 10th birthday, and ask friends and relatives to contribute an item she may like or need on that occasion. Prior to the date of the party, ask guests to send photos of themselves as babies. On the day of the party, hang them around the room. Hang a piece of paper below each photo and ask guests to write their name and their guess as to the identity of the baby in each photo. Award a prize to the person with the most correct guesses. Paste a photo of the birthday boy in the center of a piece of poster board. Have guests write messages to him on the poster board that borders the photo. After the party, frame the message board and hang it in the nursery or playroom. Bring some favorite baby books to the party. Set up a reading corner by placing a chair on which a grown-up can sit in a corner of the room, along with a mat or rug on which kids can sit and listen to a story. At different times throughout the party, gather the kids in the reading corner and ask for an adult volunteer to read one of the storybooks to them.